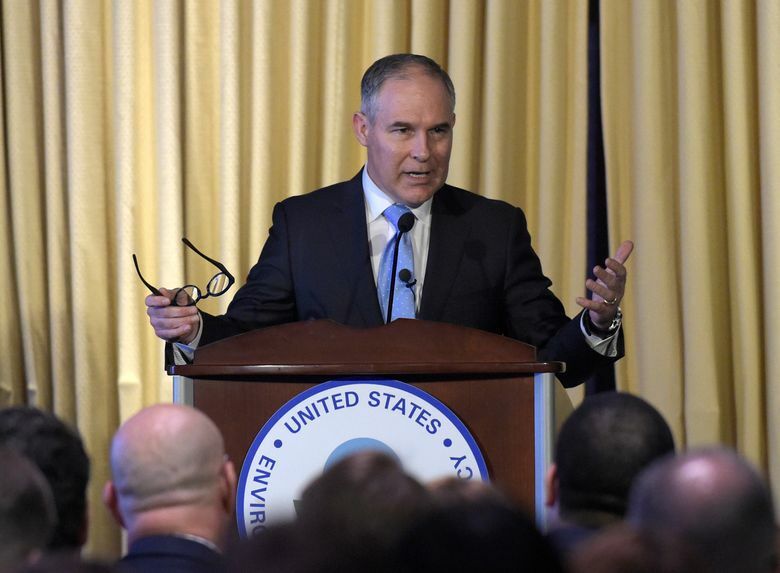 WASHINGTON (AP) — Environmental Protection Agency administrator Scott Pruitt occasionally used private email to communicate with staff while serving as Oklahoma’s attorney general, despite telling Congress that he had always used a state email account for government business. A review of Pruitt emails obtained by The Associated Press through a public records request showed a 2014 exchange where the Republican emailed a member of his staff using a personal Apple email account. Emails released under court order last week in response to a different public records request yielded additional examples where emails were addressed to Pruitt’s private account, including a 2013 exchange with a petroleum industry lobbyist who emailed Pruitt and a lawyer on the attorney general’s staff. That suggests Pruitt made his private email address available to professional contacts outside his office. It is not illegal in Oklahoma for public officials to use private email as long as they are retained and made available as public records. Pruitt’s use of the private account appears to directly contradict statements he made last month as part of his Senate confirmation. Sen. Sheldon Whitehouse, D-R.I., later followed up with Pruitt on the issue when he testified Jan. 18 before the Senate Energy and Public Works Committee. The senator asked why an email address with the Apple address me.com was listed on a form as one of his business contacts. Pruitt did not respond Monday to emails sent to his EPA staff seeking comment. Sen. Ron Wyden, D-Ore., said the issue raises questions about Pruitt’s credibility. “Now that he is in charge of protecting clean air and water in every community across the country, the public must decide for themselves whether they can trust Pruitt when he can’t even be honest about his email or his ties to the oil and gas industry,” Wyden said Monday. AP and other news organizations reported last week that 7,500 pages of emails released following a lawsuit filed by a left-leaning advocacy group showed Pruitt and his staff in Oklahoma coordinated closely on legal strategy with fossil-fuel companies and special interest groups working to undermine federal efforts to curb planet-warming carbon emissions. The emails were released after an Oklahoma judge ruled that Pruitt had been illegally withholding his correspondence, which is public record under state law, for the last two years. Pruitt’s Republican successor, new Oklahoma Attorney General Mike Hunter, has appealed that ruling and is fighting to keep hundreds more withheld emails from public view. Hunter’s spokesman, Lincoln Ferguson, did not return telephone and email messages on Monday seeking clarification on Pruitt’s use of a private email or whether more messages to the Apple account were among those still being withheld. Senate Democrats earlier this month sought to delay a vote on Pruitt’s confirmation until after the requested emails were released. Republican leaders used their slim majority to confirm him to lead the federal agency he had frequently criticized and repeatedly sued during his six years as Oklahoma’s attorney general. Pruitt’s use of private email was first reported earlier this month by FOX 25 television of Oklahoma City. Senate environment committee chairman John Barrasso, R-Wy., declined to comment Monday about whether Pruitt was inaccurate in his testimony. Barrasso’s spokesman, Mike Danylak, pointed to another exchange during Pruitt’s testimony where he was asked whether he would use only government email to conduct business at EPA, so that his correspondence would be publicly available through the Freedom of Information Act. “I really believe that public participation and transparency in rulemaking is very important,” Pruitt responded. Murphy reported from Oklahoma City.